1969 Chevrolet Camaro COPO 9561 Replica for $76,000! For today's Nice Price or Crack Pipe, we're heading to the U.S. Of A. for some baseball, hot dogs, apple pie and Chevrolet, and a Camaro that's the rarest of the rare. Or is it? Lauded automotive engineer Vince Piggins provided Hudson with numerous NASCAR championships in the early 1950s. 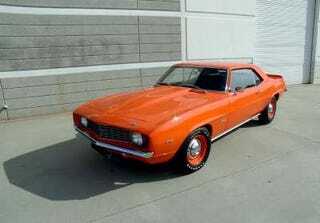 Later that decade, he moved to Chevrolet where he oversaw a series of performance models that became legendary. Seeking to dominate NHRA Super Stock, Piggins green-lighted a series of Camaros with a version of the 427cid V-8 from Bruce McLaren's Can-Am dominating Chaparral cars. Available as an option package denoted ZL1, these Central Office Production Order cars also included cowl-induction and the choice of either the heavy-duty 4-speed stick or the bullet-proof Turbo Hydramatic. Sporting an aluminum block, the 427 was officially rated at 430HP, but dyno'd at an astonishing 500HP-plus, making them the most powerful Camaro engine Chevy had offered to date. A 4:10 posi-traction rear end was employed to put that massive power on the road. All this didn't come cheap, even back in '69. Checking that ZL1 box on the options list would set you back $4,160, and took the car into nosebleed territory at over $7 grand. A total of 69 were ordered, although several of those sat on the dealer's lots and were eventually returned and re-motored. There's a lot to like in the COPO Camaro- history, performance, cutting-edge (for the day) technology. But this isn't the real deal, it's a tribute. While real COPO Camaros are as scarce as hen's teeth, and could set you back a quarter million or more, this homage pony car could be replicated again and again, meaning supply could potentially exceed demand. And the tribute car will likely never reach the heights in value of an authentic COPO. But still, $76 grand is a fraction of what the genuine car would cost, and you wouldn't be able to drive that real-deal on the street regularly for fear of damaging your investment. So is this just a really sweet grabber orange Camaro with a tasteful restoration, and worthy of a Nice Price vote at $76,000? Or do you feel it's putting on Crack Pipe airs?